How someone gets to a news organization’s website says a lot about the level of engagement and loyalty he or she displays toward the site and its content, according to a new Pew Research Center analysis conducted in collaboration with the John S. and James L. Knight Foundation. In this study of U.S. internet traffic to 26 of the most popular news websites, direct visitors—those who type in the news outlet’s specific address (URL) or have the address bookmarked—spend much more time on that news site, view many more pages of content and come back far more often than visitors who arrive from a search engine or a Facebook referral. The data also suggest that turning social media or search eyeballs into equally dedicated readers is no easy task. These are among the key findings that detail how 1 million people enrolled in one of the nation’s most popular commercial internet panels have been connecting through their desktop and laptop computers with the most accessed or shared news sites of our time. 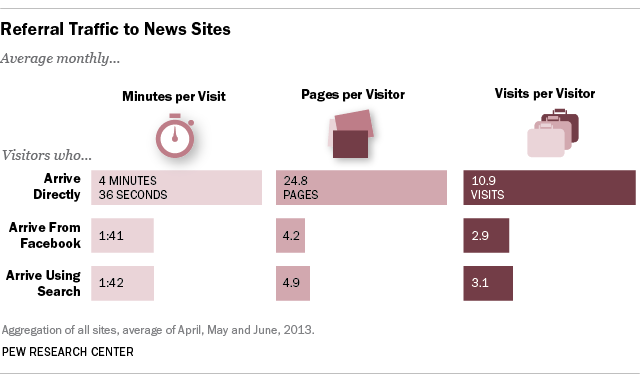 An analysis by Pew Research of three months of comScore data finds that among users coming to these news sites through a desktop or laptop computer, direct visitors spend, on average, 4 minutes and 36 seconds per visit. That is roughly three times as long as those who wind up on a news media website through a search engine (1 minute 42 seconds) or from Facebook (1 minute 41 seconds). Direct visitors also view roughly five times as many pages per month (24.8 on average) as those coming via Facebook referrals (4.2 pages) or through search engines (4.9 pages). And they visit a site three times as often (10.9) as Facebook and search visitors. This higher level of engagement from direct visitors holds true across the full mix of sites studied, from those that rank among the most shared on Facebook, such as breitbart.com, to those whose traffic is heavily driven by traffic from search engines, such as abcnews.go.com (the website for ABC News); and from those with a small total audience (mrconservative.com) to aggregators (yahoonews.com). Even sites such as digital native buzzfeed.com and National Public Radio’s npr.org, which have an unusually high level of Facebook traffic, saw much greater engagement from those who came in directly. The data also suggest that converting social media or search eyeballs to dedicated readers is difficult to do. Most people that arrived at one of these popular news sites used only one of the three modes – suggesting that, at least on desktop/laptops, individuals tend to come to these news sites using a single method. Users had not, in other words, logged into abcnews.go.com in the morning to get the latest news and then later that night followed a link to another ABC story when checking status updates on Facebook. Of the sites examined, the percentage of direct visitors who also came to the site via Facebook was extremely small, ranging from 0.9% to 2.3%, with the exception of Buzzfeed at 11.3%. Similarly, direct visitors who also came to a site through a search engine ranged from 1.3% to 4.1% – again with one exception, this time being examiner.com at 8.6%. Within these overall findings, some news sites display higher levels of overall visitor engagement than others. 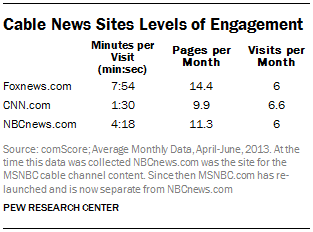 The average visitor to Foxnews.com (a site operated by the Fox News Channel), spent almost eight minutes per visit. By comparison, the average visitor to CNN spent 1 minute and 30 seconds on the site while visitors to nbcnews.com1 stayed about four minutes on average. At a time when news organizations are working to understand how consumers interact with news in the digital space and are implementing digital subscription plans while energetically pushing content in social spaces, these findings encapsulate some of the key challenges facing digital news. Facebook and search are critical for bringing added eyeballs to individual stories, and they do so in droves. But the connection a news organization has with any individual coming to their website via search or Facebook seems quite limited. For news outlets operating under the traditional model of building a loyal, perhaps paying audience, obtaining referrals so that users think of the outlet as the first place to turn is critical. The data also shed light on new audience approaches. The strategy of Buzzfeed, for example, is very different from that of traditional news organizations. It is not built around building a loyal, returning audience. Instead, it is built around “being a part of the conversation,” says editor-in-chief Ben Smith. The site’s writers and editors develop content that people want to share so that a story reaches all those it “should” reach. It may well be a completely different audience from one story to the next. That strategy is reflected in the 50% of their desktop/laptop traffic that comes in through Facebook with low engagement, but high volume – far more than the 32% of traffic that accesses the site directly and show higher levels of engagement. The revenue strategy – built around advertising rather than subscriptions – reflects that strategy as well. On the other hand, a site like the New York Times – that relies on user subscriptions for a substantial portion of their revenue, and thus, likely places high priority on loyalty and engagement – gets 37% of its laptop/desktop traffic from direct visitors and only 7% from Facebook. For organizations producing news content, what may be most critical is how much they understand about these different audience pathways and the degree to which their strategies –both in terms of content and revenue – match their audience flow. The visitor engagement data for this study comes from comScore’s U.S. panel of 1 million desktop/laptop users. ComScore does collect some mobile behavior data, and one section of this report examines that data for these 26 news sites. But the panels that comScore (and other web analytics firms) have established to track mobile behavior are, at this point, much smaller than the desktop/laptop panels. The data, therefore, cannot be broken down nearly as granularly as the much larger desktop panels. Even if the mobile panel were larger, the variation in how news organizations approach mobile could make data analysis difficult. Some news organizations have completely separate desktop and mobile sites, while others have one site that adapts to the current platform being used. In other cases, a few news outlets have developed separate mobile apps that basically serve as the mobile form of the website or have created an app (or apps) with a somewhat different orientation or mission than the site itself. Nevertheless, the analysis that Pew Research was able to conduct on the mobile data suggests an engagement pattern similar to that seen in the desktop/laptop space.